Pope Francis and the World Council of Churches have condemned bombings that have killed at least 43 people at two Coptic churches in Egypt on Palm Sunday, one of the most important days on the Christian calendar. The terror group that calls itself Islamic State, or Daesh, claimed responsibility for the two attacks on April 9, which also injured more than 100 people, Reuters news agency reported. The second attack singled out the seat of the Coptic Pope Tawadros II in Alexandria and it occurred a week before Western and Eastern Orthodox Christians are to celebrate Easter, the feast commemorating the death and rising from the dead of Jesus. Pope Francis is scheduled to visit Egypt later this month. Egypt's President Abdel Fattah el-Sisi declared three days of nationwide mourning after the bombings and stated thath once legal measures were completed a three-month state of emergency would come into force. The first bombing, in Tanta, a Nile Delta city about 100 kilometers (60 miles) north of Cairo, ripped through the inside of St. George Church during its Palm Sunday service, killing at least 27 people and injuring at least 78, the Ministry of Health said. The second, a few hours later was by a suicide bomber in Alexandria, hit Saint Mark's Cathedral, the historic seat of the Coptic Pope, killing 16 people, including three police officers, and injuring 41, said the ministry. Pope Francis offered prayers for the victims in remarks to Catholic faithful gathered in St. Peter's Square to pray with him following Palm Sunday Mass. "To my dear brother, His Holiness Pope Tawadros II, to the Coptic Church and to all the dear Egyptian nation I express my deep condolences. "I pray for the dead and the injured, and I am close in spirit to the family members [of the deceased and injured] and to the entire community." Francis went on to pray, "May the Lord convert the hearts of the people who are sowing terror, violence and death, and also the hearts of those who make and traffic weapons." WCC general secretary Rev. Olav Fykse Tveit expressed profound sorrow and offered condolences and prayers for the families of the victims, for the wounded and for all the people of Egypt. He encouraged Egyptians to stand firm and united through the many trials and tribulations that continue to threaten. Tveit said, "In the face of this brutality, the human family, all people of faith and of good will, must stand together to recommit to respecting and caring for one another, to protecting one another, and to preventing such violence." The WCC appealed to the Egypian president, to religious leaders and to governments across the region " to act swiftly and boldly to safeguard the fundamental religious rights of worshippers of all faiths." It urged them "to ensure security in the face of violence and to guarantee justice for all people. Places of worship representing many different faith traditions have been targets of violence by extremists." Tveit said, "Government action must be matched by solidarity among Muslims, Christians and people of all faiths as they interact at the local level and together denounce any violent attack." In Egypt, Al-Azhar, the highest Sunni Islamic authority in Egypt, issued a strongly worded statement condemning the attack. Christians, who make up 10 percent of 91 million mainly Muslim people in Egypt have faced attacks and harassment before. "Coptic churches and homes have been set on fire, members of the Coptic minority have been physically attacked, and their property has been looted," rights group Amnesty International had reported in March. "In these difficult and challenging times the WCC calls particularly on religious and national leaders to support the people in Egypt as they affirm life and engage in countering negative trends through peaceful means, such as proactive engagement in dialogue and partnership between Christians and Muslims in Egypt and throughout the world." 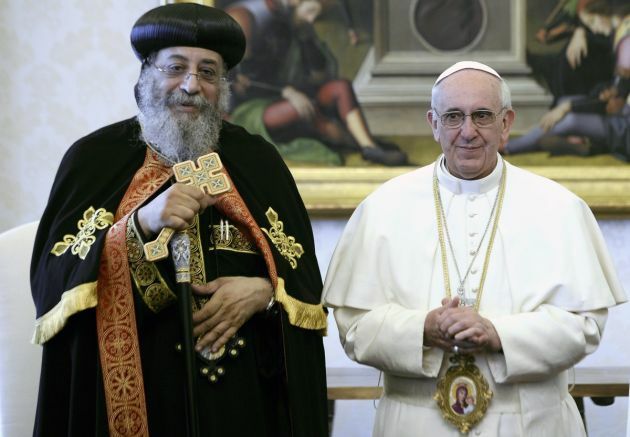 (Photo: Peter Williams / WCCv)Pope Tawadros II, Patriarch of the See of St. Mark and leader of the Coptic Orthodox Church (L) with Rev. Olav Fykse Tveit, general secretary of the World Council of Churches during a visit to the Ecumenical Center in Geneva, Switzerland on Sept. 1, 2014.